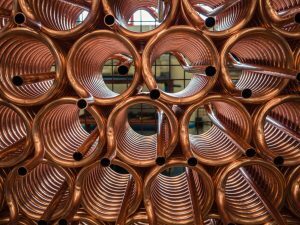 Finding the Perfect Heat Exchanger for Your Application | Noren Thermal, Inc. These days, it’s no secret that heat exchangers are often the better alternative when it comes to cooling electrical control panels. Their eco-friendly processes and low operating costs make them ideal for a wide variety of industries and applications. However, not all heat exchangers are created equal, and benefiting from the advanced thermal management technology requires finding and implementing the perfect type of heat exchanger for your specific application. Heat exchangers aren’t just designed to fit into an existing system, but to do so in the most convenient and effective way. For certain control panels, that means creating a unit that can be flush-mounted to the side using high-quality seals and gaskets to prevent contamination from entering the panel. In other applications, heat exchangers can be designed to drop into the unit while leaving enough room to avoid getting too close to sensitive electrical equipment. Besides the design of a heat exchanger, the specifications of your unique application must also be considered. For instance, ambient (or air-to-air) heat exchangers can be ideal when the ambient temperature is lower than the maximum operating temperature of the control panel. If the ambient temperature is too high, then you may need a below-ambient (or air-to-water) solution that can lower the temperature within the control panel to well below the temperature around it. Heat exchangers come in a variety of shapes and sizes, and our expertise can help you find the perfect one for your application. To learn more, call Noren Thermal, Inc. at 866-936-6736. Now located in Taylor, TX, Noren proudly produces all of our products in the United States and delivers them to clients nationwide.